Ultrasonic Facial The Ultrasonic Massage device utilizes Massage Probes to send streams of high-speed ultrasonic vibrations into the skin layers at incredible speeds of 28,000 vibrations per second. These safe vibrations are scientifically designed to break down and help remove imperfections under the skin such as dead skin cells, dirt and grease particles and black and white heads. The added benefit is a lifted effect that creates ultra-smooth, soft skin. Flat Ultrasonic Probe: Ideal for delivering the product or breaking down blackheads in large treatment areas such as the cheeks or forehead. Pointed Ultrasonic Probe: Fantastic for targeted treatments. Use this probe to break down oily deposit around the nose and chin. You can also use this to increase circulation around the eyes removing dark circles or 'bags under the eye'. It is utilized in the treatment for acne, depigmentation of the skin and also whitens of the skin. 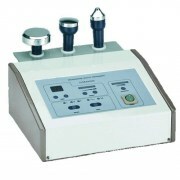 It is also called "The Wrinkle Remover"
* Whitens black spots,scar reduction, freckles and age marks.